White on Rice (Director: Dave Boyle): 40-year-old Jimmy (Hiroshi Watanabe) is living with his sister and her family after his divorce, sharing bunkbeds with his young nephew, but only until he finds someone better than his ex-wife. Alas, this potentially funny premise is not able to sustain an entire film, especially when none of the other characters feel developed enough to serve as anything other than foils for Jimmy’s pratfalls. Not much to describe in the way of plot, either. Jimmy develops a crush on his brother-in-law’s niece, but it doesn’t go anywhere. Despite cribbing from all kinds of other comedies (Napoleon Dynamite, a few of Wes Anderson’s films, even the little-seen Kiwi comedy Eagle vs. Shark), White on Rice never really rises above the quirkiness of its moon-faced protagonist. There are plenty of gaps in exposition as well. Jimmy is Japanese, and speaks Japanese with his sister and her husband who live in an American suburb, but we have no real idea whether he’s only recently moved from Japan, or whether his ex-wife lives in America too. At one point he tells a potential love interest that he’s only been divorced “a few years” but it’s unlikely he’s been sleeping in his nephew’s room for that long. Much of the humour comes at Jimmy’s expense, such as his frequently mangled English, and although the cast is mostly Asian, I wonder if this isn’t just perpetuating stereotypes other Hollywood comedies have traded in. Overall, I just expected a bit more and found myself disappointed and a bit bored by the end. The film is competently made and, at least in Watanabe’s case, enthusiastically acted. But the script failed to deliver any surprises or authentic characters. Worse than that, when it had opportunities to subvert Asian stereotypes, instead it just milked them for the film’s few cheap laughs. 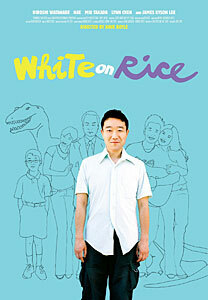 White on Rice plays today at 5:00pm at Innis Town Hall as part of the Toronto Reel Asian International Film Festival. Tickets are $12 and are available at the door. This entry was posted in Film Festivals, Reel Asian and tagged #reelasian09. Bookmark the permalink.